Maybe the Evsngelions can morph a small amount of their biology at will, such as sharpening their fingernails and extending their teeth, is that a possibility. VUX wrote: Maybe the Evsngelions can morph a small amount of their biology at will, such as sharpening their fingernails and extending their teeth, is that a possibility. 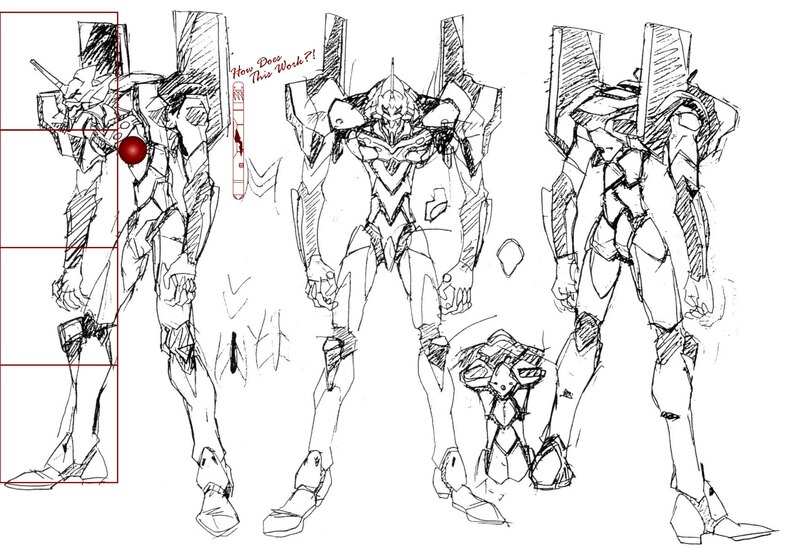 I mean, they do appear to have a certain level of metamorphic capability given the process necessary for Unit-01 to requisition Zeruel's S2 Organ, but I can't see why they'd have properties like what you're describing, and I'm generally not a fan of trying to fanwank stylistic choices into canon abilities without proof. Maybe because a prominent nose could be bashed in quite easily? Going by the phrase "EVA was created as a copy of us" ( Akagi says something similar) a prominent nose modeled like a human one has nerves running through it and could be quite the delicate thing. Any protrusion on an Unit is going to suffer damage in one form or another and a Pilot being overwhelmed by the pain of a broken nose could be quite disfortunate in a battle? It's actually not off topic since it is an anatomy question. The reason Homo sapiens has a prominent nose is because we evolved it based on how smell played into our survival. The current theory we're working off is that the Evas are in the image of the FAR, so it's possible they didn't face the same evolutionary pressure to develop one. Than why do they even have nostrils if they don’t need oxygen to live? VUX wrote: Than why do they even have nostrils if they don’t need oxygen to live? That's hard to say without more insight into the FAR. Perhaps they're the vestigial remnants of a more sophisticated nasal structure that just hasn't disappeared yet. Perhaps smell was useful to a limited extent but not enough to warrant a more complex nose. Perhaps their nose is actually more sophisticated than it looks but I'd completely internalised. Perhaps the FAR did breathe and their artificial creations wed liberated from that requirement. There's just no way to know. I was always confused by one subject, do Eva’s have skin, or are they skinless, cause sometimes they look like they have just muscle. VUX wrote: I was always confused by one subject, do Eva’s have skin, or are they skinless, cause sometimes they look like they have just muscle. They do have skin, yes, it just appears to be very tightly pulled over their musculature. That I think is just a common stylistic thing with anime. Well you wouldn't want the Units to move any larger amount of deadweight around. This deadweight could simply be body fat. This would result in a much thinner skin that follows the lines of the body like the Plugsuit the Pilot. Rather simple fan answer to the nebulous canon lore there is. Hmmm... it seems some issues of Eva anatomy are being resolved... it's time to introduce a new one ! On several occasions during the show, we see Unit 02's head opening to show, presumably, its real eyes. It's basically its way to show it's going berserk or being super-synchronized with the pilot. But that doesn't make sense at all, why would Nerv want the Eva to be capable of doing that ? What purpose does it serve ? At first I thought it was because the cameras didn't worked in berserk mode, but Unit 00's seemed to do during the synch experiments. It's not even useful for combat, it just looks kinda cool. And to add more confusion, it was apparently retconned for EoE, since EGK doesn't seems to be able to do this, even in berserk/high synch mode. Also, I know it's been discussed before, but does anyone has a solid theory of what exactly is the green thing on Unit 00's head ? I personally like to think of it as a prototype AT Field emitter or something like that. As 00 only has the one eye that gives it a limited field of view I think it is some kind of electronic eye to extend the view field. Although the pit beyond the green cover is so deep that I'm asking myself where even the Unit's brain is. Does it even have a partialy biological head with actual bone? The whole head structure makes even less sense than the others as part of the eye is even obscured from above by the front armour shell of the head. That could be it, although it'd be kinda funny. "Commander, we finally have a working prototype..."
"But the engineers screwed up the helmet's design, so we have to add another eye on top of the head." I still think this helmet design makes more sense than "several meters horn for the lulz" though. So, maybe this green thing is an artificial brain, and maybe it's used to avoid some sort of brain failures other prototypes had ? That could also explain why Unit 00 deactivated even though it was in berserk mode, since its brain wouldn't be able to function without electricity. The green bowl on top of Unit 00's head is an antenna, apparently. When is it said ? Is it during one of the activation experiments ? Oh, and I also got another anatomical weirdness to mention. When an Eva suffer an injury, it usually bleed a lot, but only for a short amount of time. You can see it in Eps 2, 19 and EoE. 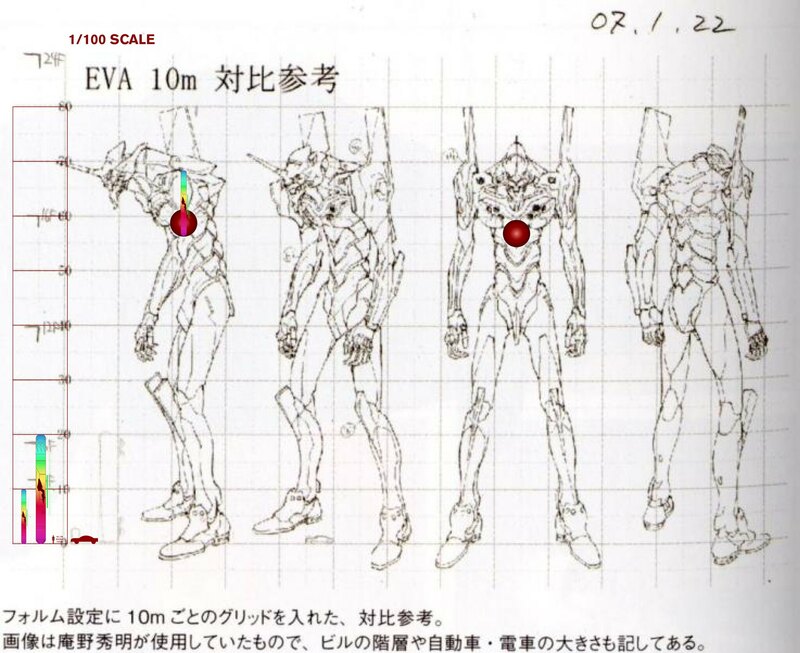 So, maybe Evas can coagulate waaaay more quickly than us, poor defenseless and weak beings, or maybe Nerv installed some sort of system to prevent blood from going to damaged body parts. Of course, it may just be an artistic choice, but I still like my theories. The green thing on the helmet is noted as being an antenna in the production drawings. One thing that has personally confounded me for some time now has been the exact size of the Entry Plug. Much like the Evangelions themselves, they too seem to shift in size depending on what Anno needed for a particular shot. Sometimes they seem to be roughly 10 meters in length, the next 20 meters (a figure which is outright nuts for the nominally 40 meter TV-Version Evangelion), and in trying to map out the way an Entry Plug is inserted *into the Core* has yielded... interesting results. Just an FYI, the entry plug is inserted at an angle (45 degrees? 35 degrees? I'm bad with numbers) to the spinal column. There's no way it can be essentially parallel to the spine as you've depicted. ...which means that no matter the length, the plug just goes above the core altogether. Welp.